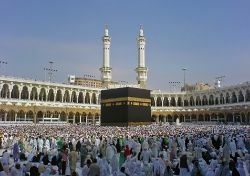 The Ka'bah in Mecca. Mecca was al-Zubayr's capital from 683 until 692. He was later accused of defiling the Ka'bah, which burned down in 683 and was rebuilt. Abd Allah al-Zubayr or Ibn Zubayr or Abdullah ibn az-Zubayr' (624 - 692) was a sahabi (Companion of the Prophet) whose father was Zubayr ibn al-Awwam, and whose mother was Asma bint Abi Bakr, daughter of the first Caliph Abu Bakr. He was the nephew of Aisha, one of the wives of Muhammad. A trusted and prominent soldier under the third caliph, he took part with Aaish and his father in the revolt against the fourth caliph, Ali in 656. Although he recognized and fought for Muawiyah, the first Umayyad caliph he refused to give his successor, Yazid I the oath of allegiance. After Yazid's death (683), he declared himself caliph and resisted the Umayyads for the next ten years from his capital in Mecca. Finally defeated in 692, he was beheaded and crucified. Regarded as responsible for the second civil war in Islam and a participant in the first, al-Zubayr's legacy has its detractors and supporters. Umayyad writers depict him as a heretic who defiled the Sacred Sanctuary and divided the Ummah. He is often referred to as an anti-caliph. Supporters see him as someone who challenged the legitimacy of Umayyad rule. Following their downfall, too, the Umayyads would be portrayed as bad Muslims who ruled autocratically, although they are generally regarded as legitimate caliphs. Yazid, though, has few admirers. The successful Abbasid coup of 750 would escape the charge of fitna (civil war) because, in contrast to al-Zubayr's revolt, it succeeded. Despite his personal sincerity and piety, in splitting the caliphate, al-Zubayr may have chosen the wrong path. What became most significant for Muslims was the symbolic value of the caliph, which represented the ideal that all Muslims, regardless of race, are equal members of a single, global entity, the ummah. Al-Zubayr was born a member of the Banu Asad. His father, al-Zubayr b. al-ʿAwwām, was a close companion of Muhammad. As well as being a nephew of Aisha, al-Zabayr was also distantly related to Muhammad, since his grandmother was Muhammad's paternal aunt. As a young man, Abdullah was an active participant in numerous Muslim campaigns against both the Byzantine and Sassanid empires. In 636 he was with his father at the Battle of Yarmūk. He marched to Sbeitla, Tunisia, the capital of the exarchate of Carthage, King Gregory. Gregory was defeated and killed in the Battle of Sufetula in 647 C.E. Uthman, the third caliph, regarded him as a loyal and capable soldier. After this battle, he allowed al-Zubayr the exceptional honor of reporting on his critical role in the battle "from the pulpit in Medina." He may have served in Uthman's body guard. He was also appointed a member of the committee that established the official recension of the Qur'an. He was among the twelve men who buried Uthman after his assassination in 656. Madelung says that it was probably al-Zubayr who, influence by his aunt, Aisah, who disliked Ali, "tried to incite his father against him." When his father joined Aisha's rebellion against the Caliph Ali, al-Zubayr accompanied him into battle against[Ali at the Battle of the Camel, commanding the infantry. This is known as the first Fitna (civil war or disturbance). His father was killed; Al-Zubayr was wounded. Ibn al-Zubayr took the oath of allegiance to Muawiyah when he claimed the caliphate from Ali and appears to have fought in the Umayyad army. However, when Muawiyah appointed his son, Yazid I as his successor and demanded that leading men recognize this by taking an oath, al-Zubayr refused. Muawiyah, suspecting that he might present a threat to his son's succession, placed him on a list of potential troublemakers. On succeeding, Yazid sent an envoy to Madina to secure al-Zubayr oath. He procrastinated then fled to Mecca without taking the oath. Messnger were "back and forth" regarding the oath, which Yazid announced he would only accept from al-Zubayr if he was brought before him in chains. After the death of Husayn bin Ali(as) at the Battle of Karbela on the 10th of Muharram, 61 AH (October 10, 680). Ibn al-Zubayr appears to have favored Shura (consultation] as the mechanism for choosing the caliph, not dynastic succession. Some suggest that he had planned to claim the caliphate even before Husayn's death but knew that he would not attract enough support as long as the prophet's grandson lived. Some claim that he encouraged Husayn's own rebellion because he thought it would fail, leaving his way clear to stake his claim. Even those who opposed the claims of the family of the Prophet to lead the community, though, were sickened and outraged by Yazid's heinous act, "This was, after all, the family of the Messenger of God" people said, "how could they have been starved and massacred like animals?" A number of those responsible for killing members of Muhammad's family were slain. Soon, Ibn al-Zubayr established his power in Iraq, southern Arabia and in the greater part of Syria, and parts of Egypt. Ibn Zubayr benefited greatly from widespread dissatisfaction among the populace with Umayyad rule. They were regarded as usurpers because Muawiyah claimed the caliphate and demanded the oath without any process of shura (consultation), then nominated his son as successor. Given that his father had served on the council of six appointed by Umar, the second caliph, to choose his successor from among themselves gave him a claim on the succession. Yazid sent al-Zubayr's brother—who was his implacable enemy—against him at Mecca. He failed, was captured, whipped and imprisoned, dying from his wounds. Speaking from the pulpit, al-Zubayr praised Husayn and denounced Yazid. Yazid tried to end Ibn Zubayr's rebellion by invading Hejaz in 683, but his sudden death ended the campaign, although some members of al-Zubayr's family were killed. It was during this two month long attack that the Ka'bah was accidentally burnt to the ground; it was rebuilt. Yazid's death threw the Umayyads into disarray with civil war eventually breaking out. Al-Zubayr now attracted considerable support from opponents of the Umayyads, including at least initially from the Kharijites. It was only after Yazid's death that he formally claimed the caliphate, promising to rule according to the Qur'an, the sunnah of the Prophet and the example of the first four caliphs and that his caliphate was contingent on keeping this pledge. Coins were minted in his name and he did gain the oath of allegiance from important cities in Palestine, Syria and Egypt. He even had some support in Damascus. He had enjoyed strong support in the Yemen, appointing "nine successive governors" there during his caliphate. He also appointed two governors to Kufa. This essentially split the Islamic empire into two spheres with two different caliphs. However, before his final defeat, Ibn al-Zubayr lost Egypt and whatever he had left of Syria to Marwan ibn al-Hakam. This, coupled with the successful Kharijite rebellions in Iraq—who abandoned his cause—dwindled Ibn al-Zubayr's rule down to the Hejaz region. In Madina, the Ansari declared their independence from Damascus, and chose their own leader. Marwān, Yazid's successor, may even have contemplated recognizing al-Zubayr. During his caliphate, al-Zubayr sent one of his brothers to Iraq who succeeded in restoring his rule there. Ibn Zubayr would finally be defeated by Abd al-Malik, who commissioned Al-Hajjaj ibn Yusuf to reunite the Islamic empire. Hajjaj defeated and killed Ibn Zubayr on the battlefield in 692, beheading him and crucifying his body, reestablishing Umayyad control over the Islamic Empire. However, it had taken a decade before al-Zubayr was finally defeated. He had enjoyed strong support in the Yemen, appointing "nine successive governors" there during his caliphate. Before he went into what was his final battle, he visited his mother and took off his armor. He went into battle wearing a silk vest, which, says Kennedy, was a sign of preparing for martyrdom, "almost a suicidal gesture." His revolt was considered to the Islam's second Fitna but had it succeeded in ending Umayyad power, the revolt would have earned a more positive description. Umayyad rule continued to be unpopular. The Umayyads would be accused of favoring members of their own family, of paying lip-service to Islam, of ruling the caliphate as if it were their personal possession and of elevating Arabs over non-Arab settlers. The Abbasid coup of 750, led by a descendant of Muhammad's uncle, had widespread support including from some Shi'a. In their inaugural sermon, the Abbasids denounced their predecessors as "autocratic" concerned mainly with "the accumulating of silver and gold, the building of castles and the digging of canals." Abd-al-Malik allowed al-Zubayr's body to be buried in the Prophet's mosque at Medina. While Abd-Allah ibn al-Zubayr controlled Mecca, the Umayyad's supporters were unable to perform the hajj there. This impacted the design and building of the Rock in Jerusalem by Abd-al-Malik, who may have intended the Dome to serve as an alternative pilgrimage venue to Mecca, given its colonnaded structure or even as a substitute. Rippin tends to argue that while it might be expected that a caliph who displaced Mecca as the point of pilgrimage would advertise his illegitimacy, this assumes that the hajj at Mecca "was already a central symbol of nascent Islam." If it was not yet established as a pillar but still developing in significance, the Dome might have been built as a "political symbol" as "two pilgrimages, one in Mecca under ibn al-Zubay and another in Jerusalem under Abd-al-Malik emerged at roughly the same time." Rippin also suggests that the link between the Dome and Muhammad's Night Journey and Ascent developed later, since none of the inscriptions "make any reference to this journey." al-Zubayr rebuilt be Ka'bah in 683, after it caught fire. He is also remembered as the source of legal decisions concerning the performance of the hajj. Regarded as responsible for the second civil war in Islam and a participant in the first, al-Zubayr's legacy has its detractors and supporters. Umayyad writers depict him as a heretic who defiled the Sacred Sanctuary and divided the Ummah. He is said to have lost support because of his own tendency towards miserliness and losing his temper. Following the Umayad's downfall, they would themselves be depicted negatively as bad Muslims who ruled autocratically, although they are generally regarded as legitimate caliphs. No one impugns al-Zubayr's piety. Admirers see him as challenger the legitimacy of the impious Umayyad usurpation of the caliphate. In contrast, al-Zubayr is often described as an anti-caliph. Muslims would discuss whether rebellion against an unjust caliph is permitted pr prohibited. The kharijites said yes but many replied that protecting the unity and stability of the community was better than fitna. However sincere, in this view, al-Zubayr was mistaken to rebel against the caliph, although since he never did take the oath of allegiance, he did not actually rebel. He may have had as many supporters as Yazid's successor did. Culture War can be identified behind different portrayals of Abd-Allah ibn al-Zubayr's life. Many Muslims hoped that the Abassids, who lead a successful revolt which has never attracted the charge of fitna, would restore an elected or chosen caliph, which al-Zubayr had himself favored although in the end he, like they, did nothing to formalize this as a mechanism. Later, the tradition became more concerned with delineating the duties of the caliph than with how he was to be chosen. What became most significant was the symbolic value of the caliph, which represented the ideal that all Muslims, regardless of race, are equal members of a single, global entity, the ummah. It also stood for the integration of the spiritual with the political, ensuring at least in theory harmony between the law of the state and divine law. In splitting the caliphate, al-Zubayr may have chosen the wrong path, even though Yazid is remembered as a villain. Vilified by Shi'a his reputation among Sunni is equally negative. ↑ Muḥammad Khālid, Men Around the Messenger (Kuala Lumpur: Islamic Book Trust, 2005, ISBN 978-9839154733), 306. ↑ 2.0 2.1 Wilferd Madelung, The Succession to Muhammad: A Study of the Early Caliphate (Cambridge, UK: Cambridge University Press, 1998,. ISBN 978-0521646963), 105. ↑ 4.0 4.1 Reza Aslan, No god but God: The Origins, Evolution, and Future of Islam (New York, NY: Random House, 2005, ISBN 978-1400062133), 177. ↑ Ṭabarī and I.K.A. Howard, The Caliphate of Yazīd b. Muʻāwiyah (Albany, NY: State University of New York Press, 1990, ISBN 978-0791400401), 10. ↑ Ṭabarī and Howard (1990), 11. ↑ Ṭabarī and Howard (1990), 2. ↑ 9.0 9.1 Abd al-Muhsin Madʼaj M. al-Madʼaj, The Yemen in Early Islam (9-233/630-847): A Political History Durham Middle East monographs, no. 3. London, UK: Ithaca Press, 1988, ISBN 978-0863721021), 159. ↑ The Ansari were those Muslims who invited Muhammad to migrate to Medina in 622. ↑ Hugh Kennedy, The Armies of the Caliphs: Military and Society in the Early Islamic State (London, UK: Routledge, 2001, ISBN 978-0415250924), 170. ↑ Garth Fowden, Quṣayr ʻAmra: Art and the Umayyad Elite in Late Antique Syria Berkeley, CA: University of California Press, 2004,ISBN 978-0520236653), 172. ↑ Andrew Rippin, Muslims: Their Religious Beliefs and Practices (London, UK: Routledge, 2005, ISBN 978-0415348829), 67. ↑ Ṭabarī and Howard (1990), 224. Aslan, Reza. No god but God: The Origins, Evolution, and Future of Islam. New York, NY: Random House, 2005. ISBN 978-1400062133. Fowden, Garth. Quṣayr ʻAmra: Art and the Umayyad Elite in Late Antique Syria. The transformation of the classical heritage, 36. Berkeley, CA: University of California Press, 2004. ISBN 978-0520236653. Kennedy, Hugh. The Armies of the Caliphs: Military and Society in the Early Islamic State. Warfare and history. London, UK: Routledge, 2001. ISBN 978-0415250924. Khālid, Khālid Muḥammad. Men Around the Messenger. Kuala Lumpur: Islamic Book Trust, 2005. ISBN 978-9839154733. Lewis, Bernard. The Political Language of Islam. Chicago, IL: University of Chicago Press, 1991. ISBN 978-0226476933. Madʼaj, Abd al-Muhsin Madʼaj M. The Yemen in Early Islam (9-233/630-847): A Political History. Durham Middle East monographs, no. 3. London, UK: Ithaca Press, 1988. ISBN 978-0863721021. Madelung, Wilferd. The Succession to Muhammad: A Study of the Early Caliphate. Cambridge, UK: Cambridge University Press, 1998. ISBN 978-0521646963. Rippin, Andrew. Muslims: Their Religious Beliefs and Practices. Library of religious beliefs and practices. London, UK: Routledge, 2005. ISBN 978-0415348829. Ṭabarī, and I.K.A. Howard. The Caliphate of Yazīd b. Muʻāwiyah. SUNY series in Near Eastern studies. Albany, NY: State University of New York Press, 1990. ISBN 978-0791400401. History of "Abd-Allah ibn al-Zubayr"
This page was last modified on 29 December 2017, at 17:37.